Spray 5- or 6-quart oval slow cooker with cooking spray. Mix melted butter, tomato paste and salt in slow cooker. Add onions and mushrooms; toss to coat. Stir in broth. In large bowl, mix beef, bread crumbs, milk, egg, grill seasoning and soy sauce. 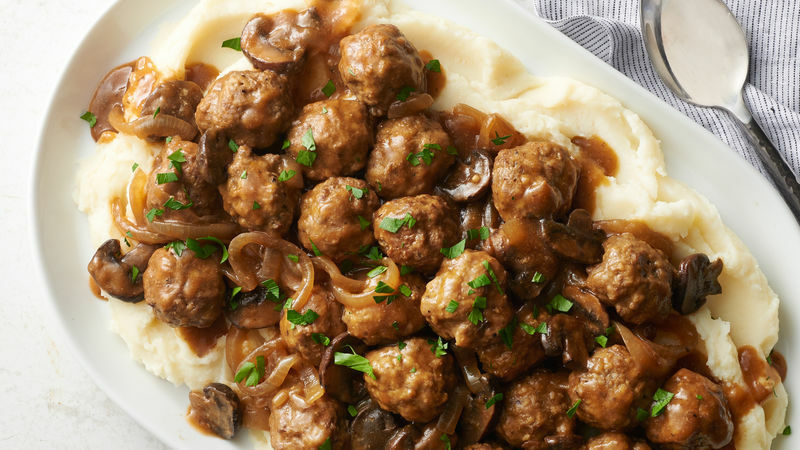 Shape into about 24 (1 1/2-inch) meatballs. Place meatballs in slow cooker on top of vegetable mixture. Cover; cook on Low heat setting 3 to 4 hours or until meatballs are thoroughly cooked (165°F); stir. In small bowl, beat cornstarch and cold water. Quickly stir into slow cooker; cover. Increase to High heat setting; cook 5 to 10 minutes or until thickened. Serve over mashed potatoes. Sprinkle with parsley. Dampen hands slightly when shaping these tender meatballs to help prevent sticking.